Ad impressions served on tablets surged 34% in quarter two of the calendar year, while smartphone impressions continued to record strong growth and Apple continued to dominate, according to analysis of impressions served on mobile ad network InMobi. The network’s quarterly ‘Australian Mobile Insights Report’ revealed that Apple devices – the iPhone, iPod and iPad – increased their share of the rapidly increasingly number of ad impressions being served through mobile devices. 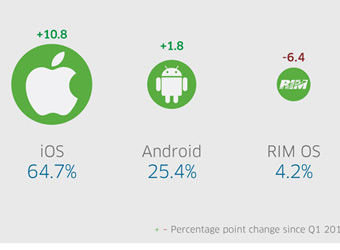 At the overall operating system level, Apple’s iOS grew 10.8% on quarter one to command 64.7% of mobile impressions. The iPhone dominated all other devices, increasing its share from 43.7% to 51.6% and putting it well ahead of the next most prolific device – the iPod with 7.4% of impressions. 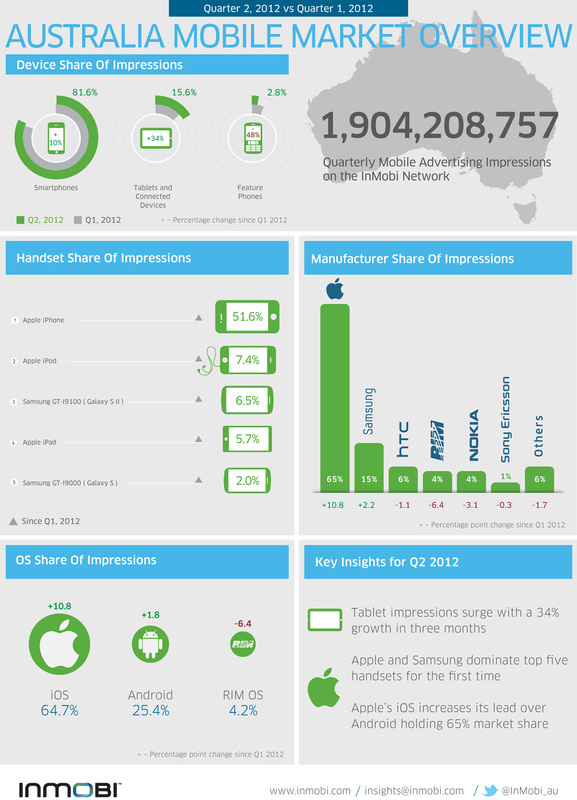 The iPad was also dominant over its competitors, garnering three-quarters (73.5%) of tablet impressions and 5.7% of impressions across all devices, making it the fourth highest server of ads overall. Its nearest competitor, Samsung’s Galaxy Tab 10.1 Inch model delivered 11.8% of ads served to a tablet device. Ad impressions served on smartphones increased by 10% over the period, with Samsung’s S and S II models rounding out the top five devices for ad impressions, making the top five handset list a Samsung-Apple duopoly for the first time. RIM’s BlackBerry 9700 previously sat in fifth place but thanks to a 6.4% drop in impressions served on RIM’s network the handset has dropped to sixth. Head of InMobi Australia and New Zealand, Francisco Cordero, says the exponential growth in tablets is due to reduced retail prices and richer web browsing experiences associated with the larger screen format, and is only set to continue. Growth in impressions served on the Android network could not match iOS, with Google’s operating system growing by only 1.8% quarter on quarter to reach 25.4% of impressions. Samsung devices commanded 12% of impressions, an increase of 2.2%, while HTC was down slightly to 6% and RIM languised with 4.2%. Even higher growth in tablet impressions was experienced in New Zealand, with a 78% jump indicating a strong upward trend in tablet usage across the Pacific region. Earlier this year, InMobi opened a second Australian office in Melbourne, helping it serve over 1.9 billion ads in Australia between April and June this year.